Kind of sort of...but not really the case here. I thought I saw a post about procrastination today as it related to NanoWriMo. I was right. It was here: http://lisacollins.wordpress.com/2014/10/22/nanoprocras101a/#comment-389. This form of procrastination is what I call productive procrastination. You are still doing something, and at least it's not a binge of Walking Dead or Orange is the New Black, trying to forget about how much you hate writing. 1) They must actually be a part of the pre-writing, post-writing, writing, marketing, or planning process. 2) The act of productive procrastination must be tempered with some sort of writing each day ON THE BOOK YOU ARE PRIMARILY WORKING ON. Think of it as "Hey, I binged-ate a cake, I better have some broccoli to help it move through the system." 3) Your productive procrastination can't be meandering acts. The must actually have a finished product in and of themselves. In a moment I'll explain. -I have kept my social media presence consistent (not overly visible, just "Hey. I'm here, Don't unfriend/unfollow me because you think I'm One of Those Fly By Night Writers.). -I have looked into places to smartly advertise my next sale. For instance, a Book Bub ad would be a lovely thing, but I need more books under my belt first so that I can have a better funneling effect. 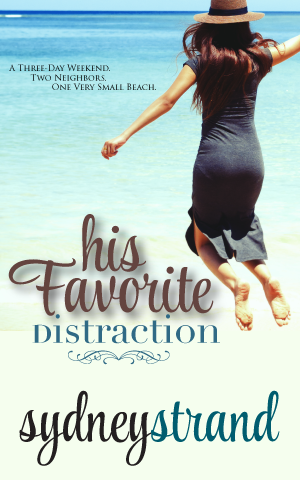 -I drafted blurbs for HIS FAVORITE DISTRACTION that will appear on the book, my website, Amazon and Goodreads. I'm someone who has to look at something for a long time to see if I like it or not, so it's good to start the process now. -I'm looking at doing some giveaways for the holidays, and I enjoyed looking at a few products on Etsy to give away. -I have created a bookmark that will be the template for postcards, too, that will go out this holiday season. All newsletter subscribers will get one (hint hint). Sign up for The Oh Goody GOODIES Newsletter! And yes, through it all, I've been eating my broccoli and have also been writing through the dreck of Draft #3. After all, with this much work BEHIND the scenes already done, talk about being prepared and even pushed to finish the book in order to see the fruits of my labor! How about you? Do you do behind-the-scenes work in order to be productive during your non-writing time?